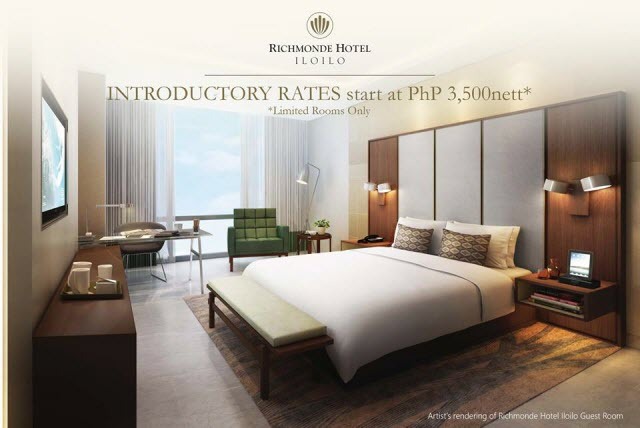 To celebrate the successful soft opening of the new Richmonde Hotel Iloilo, the hotel is offering its special introductory rates available for a limited number of rooms only. Room rates include Wi-Fi access and breakfast at Richmonde Hotel Iloilo's all-day dining restaurant, The Granary. Rates are inclusive of government taxes and service charge and are subject to room availability. For inquiries and reservations, call +63 33 328 7888 or +63 917 5809642 or email rhireservations@richmondehotel.com.ph. Online bookings with instant confirmation also available at www.richmondehotels.com.ph. Richmonde Hotel Iloilo is a 142-room hotel located within the 72-hectare Iloilo Business Park development of Megaworld Corporation. It is the first Richmonde brand hotel to open outside Metro Manila. Richmonde Hotel Iloilo features luxurious rooms and spaces which took inspiration from Iloilo's most important agricultural crop, the sugarcane. The property was designed by The Gettys Group, the international hospitality design group behind Resorts World Manila, and the Marriott Grand Ballroom of Marriott Hotel Manila.